Gujarat Fortunegiants are now top of the table in Zone A with 58 points from 14 matches. Gujarat Fortunegiants ended their home leg of the Pro Kabaddi League (PKL) with a comfortable 40-31 win over Haryana Steelers on Thursday. Sachin led the scoring with 10 points while defender Parvesh Bhainswal achieved another high five and scored 6 tackle points. Monu Goyat had an indifferent first half but ended up being the top scorer for Haryana Steelers with 10 points. Gujarat's top raider Sachin also hit the 100-point landmark in this edition of PKL. Haryana Steelers are fifth in the table with 26 points from 14 matches. Mahendra Singh Rajput got Gujarat Fortunegiants off to a flying start as he made a super raid in the first minute. Haryana Steelers composed themselves and forced a super tackle in the third minute to trail 2-5. Haryana got their first raid points in the fifth minute when Anand Tomar got a two-point raid. Gujarat Fortunegiants inflicted the first all out of the match in the 7th minute to lead 11-4. Vikas Kandola got a two-point raid in the 9th minute as Haryana Steelers trailed 6-13. Monu Goyat who had a quiet first half came to life in the 17th minute to come up with a super raid for Haryana Steelers. Sachin got a two-point raid for Gujarat in the 18th minute as Gujarat Fortunegiants went into the break leading 21-15. The second half saw Gujarat not relenting under the pressure Haryana attempted to pile on. 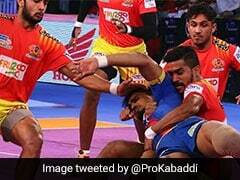 In the 27th minute, Haryana suffered another all out as Gujarat threatened to run away with the match. With less than 10 minutes to go Gujarat held a nine-point advantage as they led 30-21. Parvesh Bhainswal continued his fine form as he put in a strong tackle in the 34th minute to give Gujarat Fortunegiants 33-22. Sachin and Monu Goyat got a couple of raid points for their teams as Gujarat led 35-25 with less than five minutes to go. Gujarat Fortunegiants were never in danger of losing their lead as they coasted to a comfortable win. The only low point was a knee injury suffered by Mahendra Singh Rajput in the second half.